The butcher I frequent in the next village over has a small quantity of wine that they make and sell directly in the shop, certified under DO Montsant. Distracted by cuts of meat and wondering what they may have hidden away in the back, I always forget to ask if it’s some small plot of grapes that the owner has and gets vinified at the local cooperative or it’s just some own label affair that they buy in. Either is a possibility. The truth is, at some point, people living in wine regions will often make wine in some form or another. Whether it’s me, just mucking about or a restaurant owner who made a wine in tribute to her husband’s passing. The basics of many wine are so incredibly simple that the temptation is always there and when surrounded by excellent fruit and trained enologists who can nudge you in better directions, why not? This is why it was unsurprising when in Ampuis (the de facto capital of France’s Côte Rôtie and Condrieu appellations) that a local vegetable market called, Les Jardins de la Côte-Rôtie we found a wine that they make under the name of Domaine Christiane Chambeyron-Manin. 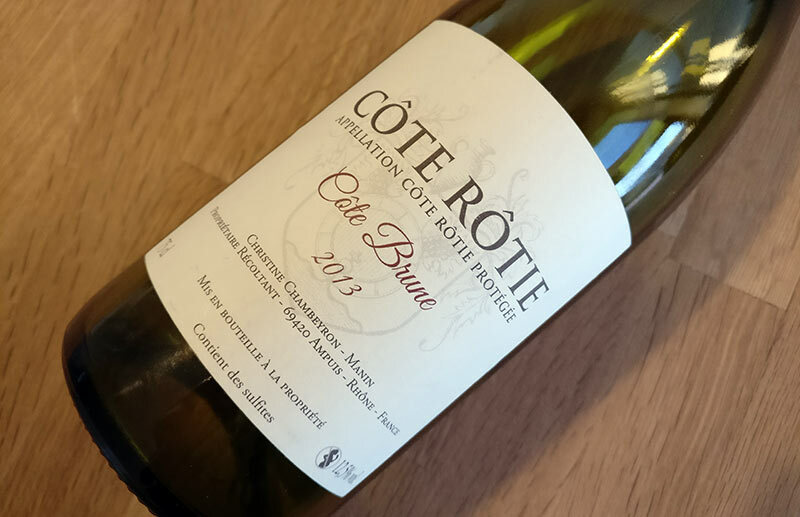 The shop owners have a 0.5ha parcel in the “Côte Brune”, or “brown slope” of Côte Rôtie which they use to make this small-production wine. It’s unclear, but it seems they have a total of 4ha in the appellation but which is maybe sold off to other wineries. Overall, while there are schmancier Côte-Rôtie wines, they come with schmancier prices and this is well priced for the region. It’s important to note that it’s from the 2013 vintage which was kinda wonky for Northern Rhône. They started out with a risk to reach full maturity in the fruit but then a heat spike leading up to harvest brought about full ripeness. Given that, wines like this have a touch of an issue in terms of balance and the alcohol is a bit more prevalent than how I could see other years being. If I were to taste this year blind, I don’t think I’d even get the grape right, let alone the region as it’s something of an outlier. Regardless, it drinks very well and is a fun, “rare wine” to pick up if you find yourself in the region. Crisp red cherry, light cranberry, blueberry at the base with anise, and allspice notes. Old wood and the lightest hint of wet earth. Full and crisp on the mouth but with medium acidity. Could still use a bit more integration on the palate as the alcohol runs a bit spicy.